One thing is for sure with this market--You had better be precise with your stock and industry selection. 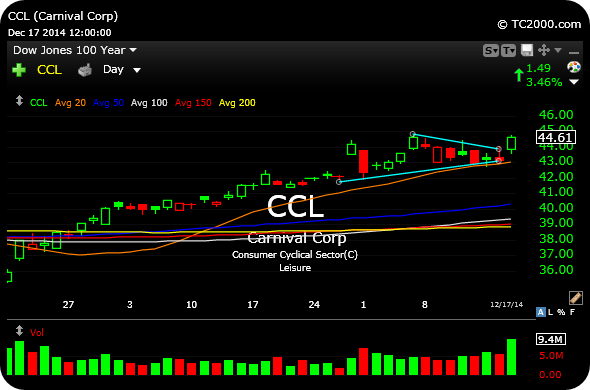 As an example, within the consumer discretionary space we have the major casinos essentially crashing, in LVS MGM WYNN, while the major cruise lines look as bullish as any group of charts around, CCL (first chart, below) NCLH RCL. As I stated in my video market recap for Wednesday, I would not be surprised to see the casinos stage a sloppy oversold bounce from here into year-end. But that would not negate the significant damage done, as we head into 2015. The cruise lines, on the other hand, can all be deemed as actionable long setups if the market follows-through on Wednesday's sizable rally. 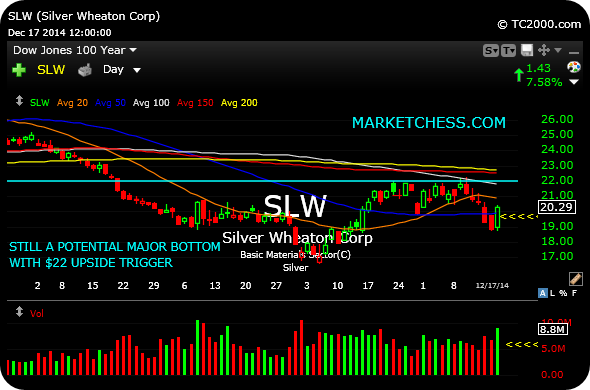 In addiiton, it is worth noting that lost in the shuffle on Wednesday was the high buy volume bullish engulfing candle printed on premier silver miner Silver Wheaton's daily chart, second below. If silver bulls can make another run at $22 above I believe a major bottom will finally be confirmed, despite how slippery it has been for metals and miners. And if the market rolls back over and traps buyers from Wednesday, I would favor index ETF shorts over individual shorts, as well as a volatility long, in lieu of individual shorts at this point.